Vladimir M. Myasishchev was responsible for contributions to a number of Soviet aircraft designs from 1924, but is best known for the Myasishchev M-4 which was the nation's first four-engine turbojet-powered strategic bomber to become operational. 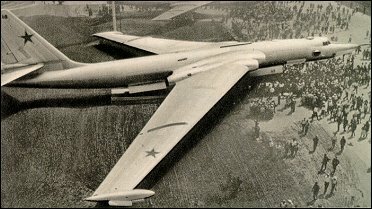 Following its maiden flight in late 1953, the type was first displayed in a fly-past over Moscow on 1 May 1954. A mid-wing cantilever monoplane with a deep section swept wing, the M-4 has a tail unit with all-swept surfaces, and retractable landing gear comprising two main units in tandem on the fuselage centreline, each with a four-wheel bogie, plus twin-wheel outrigger balancing units which retract into the wingtips. The circular-section fuselage incorporates a pressurised nose compartment and tail turret for the crew, and a large internal weapons bay in the lower fuselage between the main landing gear units. The powerplant comprises four turbojets buried in the wing roots, these being initially Mikulin AM-3Ds each of 8700kg thrust. Designed to carry thermonuclear weapons over intercontinental ranges, the initial bomber version, which has the NATO codename 'Bison-A', is believed to have entered service initially in early 1956, and production probably totalled about 200 aircraft. Subsequent modified versions have included the maritime reconnaissance 'Bison-B', first identified during 1964, which had a radome in a solid nose replacing the glazed nose of 'Bison-A', and the even later 'Bison-C', which was also for maritime reconnaissance and introduced a larger radar installation in a lengthened nose. A number of 'Bison-A' bombers have been equipped to serve as inflight-refuelling tankers, with a hose-reel unit mounted in the bomb bay. One other version is known, a test-bed aircraft powered by four D-15 turbojet engines each of 13000kg thrust and designated 201-M This was used in September 1959 to establish a number of payload-to-height records. About 40 tanker/transport versions of the M-4 were estimated to remain in service in 1992. These are to be replaced by II-78 'Midas' tankers. A soviet copy of the Victor bomber except this was nuclear powered. The truth is that early model examples lacked the intercontinental range and the missile equipment of the Tu-95. Certainly it was not a copy of western or Nazi plan but rather an indengenous Russian one. Myasischev after all was a very experienced designer at the time. Dr. Nick Stage-PHD, there are no information avaliable about Kurt Tank's TA-468A design. I think you just "make up" this project to prove thouse silly Russians can't ever come up with good aircraft. F-89's, would have decimated this bomber attack groupings. USAF fighter aircraft could maintain speeds above 620 mph. The aircraft controls required Soviet "musclemen"
in full operation, during this aircraft's deployment. Joseph Stalin did not have the needed "aero-brain-power"
prototypes, so there was a high crash rate. flights. Over-heating was a constant engine problem.